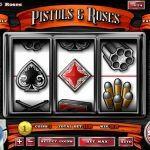 Pistols and Roses is a 3 reel 1 payline slot game, released in 2015 by Rival. If you like rock from the late 80s / early 90s and of course pistols then this is the game for you! The interface is somewhat minimalistic, the background is vintage and the tattoos and motorcycles are abundant. Rival knows its audience and this is truly a game you can get addicted to. The single payline is displayed in red above the reels. As usual, identical symbols are required to appear on each of the three reels but the wild cards make it much more interesting! So the bonus stage is a real treat. It consists of three stages where is Stage 1) you have to pick 3 out of 8 icons and if you win sufficient credits you move on to Stage 2) where you pretty much have to continue doing the same thing but with larger prizes and threshold in order to advance to Stage 3) where the prizes are again larger. If you reach a total of 800 credits (which is a bit hard) then your wins will be doubles. I don’t even mention the possibility of winning extra picks and spins which make things more interesting. 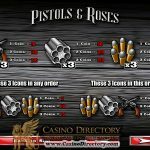 Pistols and Roses is a typical three reels slot where you have to match all three symbols to win. The cards are the lowest paying matches (win up to 60 coins) where pistols , barrels and bullets will win you more (up to 210 coins) when matched. The Roses are the wild symbols and they will substitute any other symbol. You can win up to 1, 500 coins with 3 Roses. Also, when the roses are swapped to make combinations, the winnings are instantly doubled! 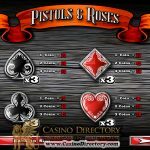 To sum things up, Pistols and Roses is standard enough for a classic enthusiast to enjoy, but with the wild roses, you might find yourself enjoying the game and theme even more as they have the ability to trigger many impressive winnings and payouts with the multipliers involved. Not sure about 3 reels slots? Try Star Jewels, a 5 reel slot by Rival.